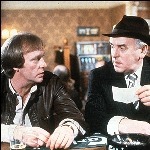 Undoubtedly my favourite Minder episode ever - I have seen it many times and the dialogue still tickles me everytime! The dialogue and characters in this one are superb from start to finish - Rycott and Jones on top form throughout, Arthur down on his luck and desperate not to get nicked, Terry shafted by everyone for being the nice guy. Justin playing the wide boy to perfection. Self Inflicted Sid - undoubtedly the best other character to grace a Minder episode. There are so many funny lines in this one but my favourite has to be 'Strong smell of petrol around here?' from Jones - knowing he was inebriated on set and this line is a rerecording makes this sound even funnier than it is. Other top lines: "It's on top! It's on top! ", "put my boat on offer", "I'm one of your own" - truly great and hilarious from start to finish. Rycott is superb in this one and for me this episode is proof that he is any match for Chisholm. If Tony Hoare based this on a true story somewhere there must be some pretty silly criminals out there! In this one it is clear that the ridicule of old bill is very high on his agenda! Overall 10/10 - Love it! Dave calls Terry Charlie??!! In the Winchester Terry has a pop at Arthur and Dave pulls Terry back and says 'Steady on Charlie, he's not getting any younger'. Charlie is the character played by Roy Kinnear, who is also in the scene. Surley I am not the first to notice this? Have another listen, I think he says "Steady on Tel". Yep, having a return visit to that scene you are right. Having said that if you expect 'Charlie' it does sound like that! But then again if you expect 'Tel' you hear that too. Odd! Bit like seeing two different faces in one of those picture things. It's the first time I've seen Tel get blown out by a lady in this episode, he crashed & burned in the launderette! It's a great ep but it feels strange because Self Inflicted Sid also plays a character in Waiting For Goddard. When shown on ITV4 it's the next ep but originaly there would of been a years difference between episodes. God bless George I love him like my own dad. I love the bit where they think of burning the truck and wonder who they could get to do it. Cut to the next scene with Arthur with a big grin approaching Sid in the Winchester "Sidney........!" I remember when this was shown originally, I was just turned 13 and was allowed to stay up to watch all of it, as I was the school Christmas holidays. My mum and step dad had just had a terrible argument and the atmosphere indoors was a bot tense to say the least, when Rycott fell, I wet myself laughing and they just glared at me! Looks like Arthur wasn't the first! The Sweeney boys got there first...(having poor old Roy flat on his back in the motor)! Absolutely wonderful episode that gets Series Seven off to a great start. 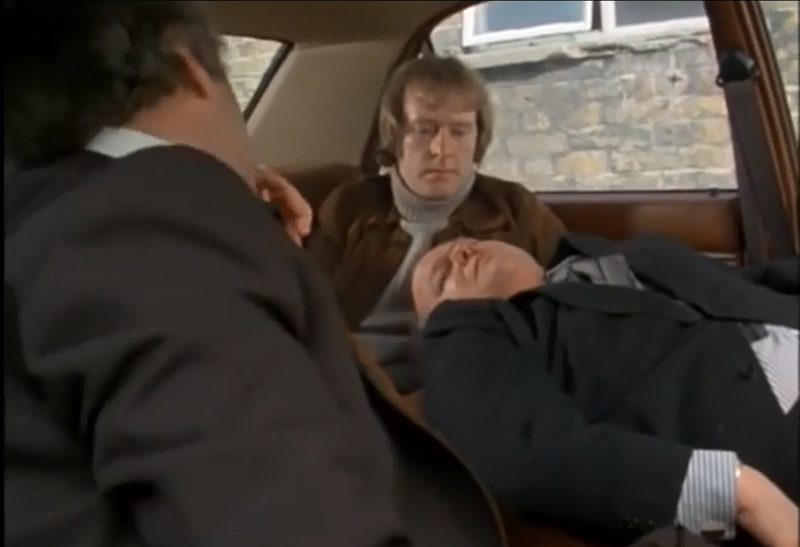 I did think the climax was a bit weak because the people looking at the accident seem more like they are watching the filming of an episode of Minder rather than the the result of a traffic accident. Justin's plan is clever though. Is there any particular reason why Arthur buys Terry a drink in the beginning scene at the Winchester? It's almost like he owed Terry for something. I believe this is inferred poverty across the board i.e. if Arthur is down on his luck, Terry's got nothing on either, but however desperate things have become, the boss always has a little more disposable wedge in his pocket. So what do all good bosses have to do? Keep their employees sweet by offering them an incentive and in Terry's case that's in the form of an emergency Light Ale. 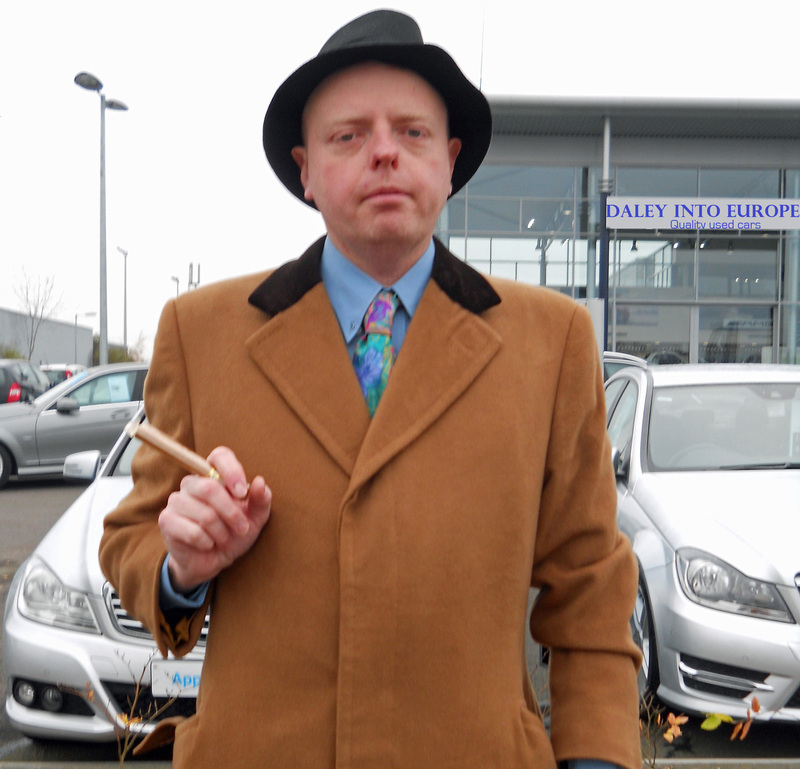 Times must have been rough, as Arthur is driving that dodgy Ford Granada! Oh, and he later tells Terry he's fired! Self-Inflicted, Jones with an 80s haircut, "He looks like a BUPA salesman's worst nightmare", Arfur's hard-times Granada, "Titter and mock, titter and mock...". Oh no, I've reached the final series! Remember the TV Times cover - "They're back!" - and thinking they should have copied the Radio Times Morecambe & Wise cover and photographed them from behind. Arthur's cowardice in this episode makes the humour, such a laugh having him on the one hand, playing the old villians codes with self inflicted, we look after our own etc like he's reggie Kray, the next he's on the floor, under a sack shouting 'it's come on top, it's come on top' and demanding every man for himself so he can escape! Awesome writing! One of the things about the series I like - Jones' little complicit glances and looks of sympathy as if he's almost apologetic for Charlie's ("Albert!") behaviour. I always felt sorry for 'Taff', not just because he was lumbered with Chisholm - and all the Welsh jokes - but his 'nose' and style of policing always seemed more instinctive and successful than Chisholm's. "Jones.........."
Ronald Fraser was brilliant as Self Inflicted Sid. The Jones Rycott rivalry is good here, though the jury's out whether Jones' (quick) promotion was the correct thing to do. His new DC was very unmemorable though. Rycott's fall was brilliantly done. Justin(e) was also in fine form here. Great guest cast here, Roy Kinnear looked very large. Ken Farrington had a 20 year on-off role in Coronation Street as Billy Walker. It seems to me that by this point in the series, Arthur owes Terry quite a few drinks for various reasons. I thought I enjoyed this episode the first time. I just watched it again and enjoyed it even more this time! A wonderful episode from start to finish. I like the parts with Arthur and Justin. My only, minor, quibble is still the crowd that gathers at the end is obviously watching a TV show being filmed. The episode had a slow start in my opinion, I mean the first 30 minutes but I think that was simply getting all the characters out of the way considering Chisholm isn't in this. The final 20 minutes were great and really picks up and how the fire towards the episode got started made me laugh. As westlnder states a slow starter, but as it progresses it becomes a worthy watch.